Young writer-director Shane Meadows is fast making a name for himself as a social commentator in the mould of Ken Loach – his films, such as Dead Man’s Shoes (2004) Once Upon a Time in the Midlands (2002) and A Room for Romeo Brass (1999) are uncompromising and unforgiving, but have a solid respect for audiences who want to be entertained, rather than preached to. 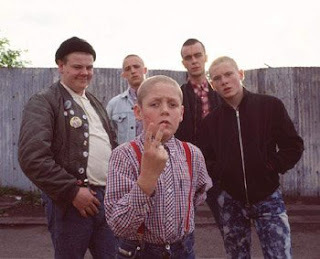 It’s probably his earlier work in short features that’s given Meadows the ability to get the point across without flab or blur – and his talents have already been recognised, with BAFTA bestowing Best British Film 2006 on This Is England, the tale of Shaun (a very believable performance from Thomas Turgoose), a precocious, troubled lad growing up in 1983 England, who is befriended by a group of skinheads on his way home from school, after Shaun’s come off worse in a scrap with another boy who was making fun of his father, a Falklands Conflict victim. The film manages to balance the light-hearted with menace and tension that’s excruciating to endure, while Danny Cohen’s cinematography captures the 80s look and feel perfectly, which only adds to the realism - and what separates This is England from other similarly themed films is Meadows’ refusal to reduce matters to simply right versus wrong, left versus right. He reminds us that the skinhead movement was traditionally multi-cultural, where working-class English and West Indian kids bonded over Jamaican artists such as Toots and The Maytals and The Upsetters. Mass unemployment under Thatcher resulted in the working-class feeling threatened, which gave rise to the racist attitudes one often associates with skinheads. Combo’s politics may be abhorrent, but Meadows takes great pains to show how his character is not necessarily a victim, but a product of the Thatcher era. Unlike the typical one-dimensional skinhead we’ve seen countless times before, Meadows exposes a few cracks in the facade, revealing a complexity of contradictions that shuns a simple vilification of the character. Looking like a pint-sized Winston Churchill (and commanding a similar presence) Thomas Turgoose is remarkable as Sean, and there’s no doubt his own troubled childhood informs much of his performance. As Combo, Stephen Graham makes a strong case for entry into the pantheon of great modern English actors, and his performance ranks up there with the best from Tim Roth, David Thewlis, or Ray Winstone. My only gripe with the film is the third act, where an event leads to an epiphany in a way that feels a bit forced, or at least too conventional when compared to everything that preceded it, creating a moral centre that seems superfluous to what has gone before.